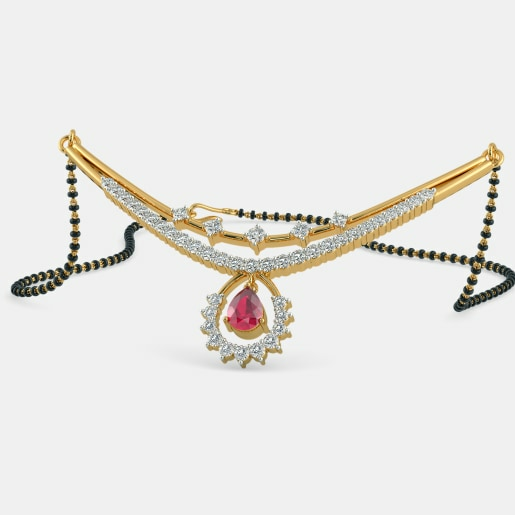 In a Hindu marriage ceremony, the wedding mangalsutra plays a significant role. During the wedding ceremony, the groom ties the mangalsutra around his bride’s neck. 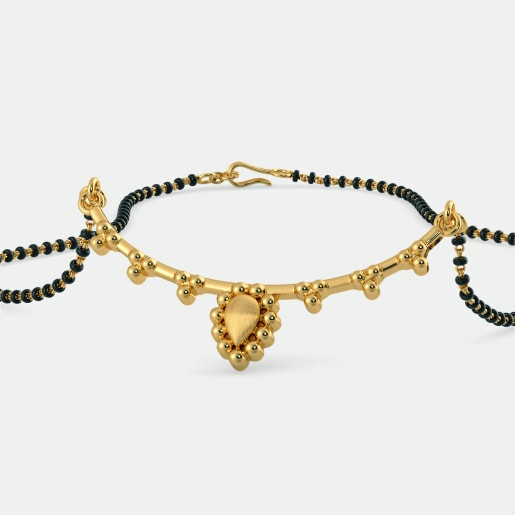 For a Hindu married woman, the wedding mangalsutra is one of the five significant symbols of her marital status along with the sindoor, bangles, nose ring, and toe ring. It is considered to be her most precious ornament. From the moment she adorns this trinket, it often becomes a permanent feature of her getup. 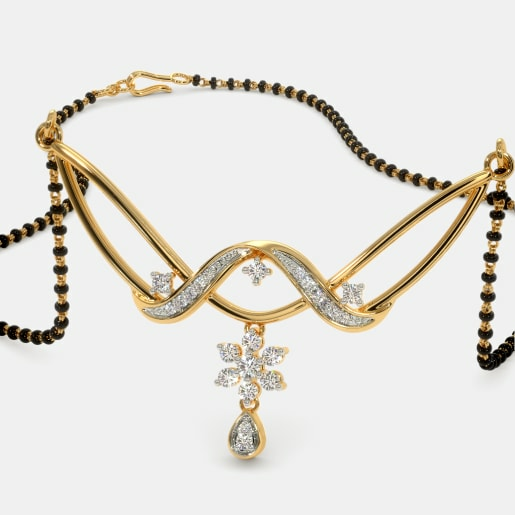 Many a woman continues to wear the wedding mangalsutra throughout their wedded life. 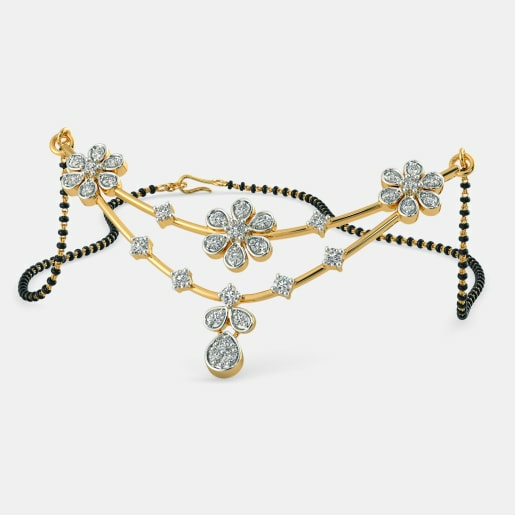 Traditionally, a wedding mangalsutra comprises of one or two strings of black beads with a pendant in the centre. 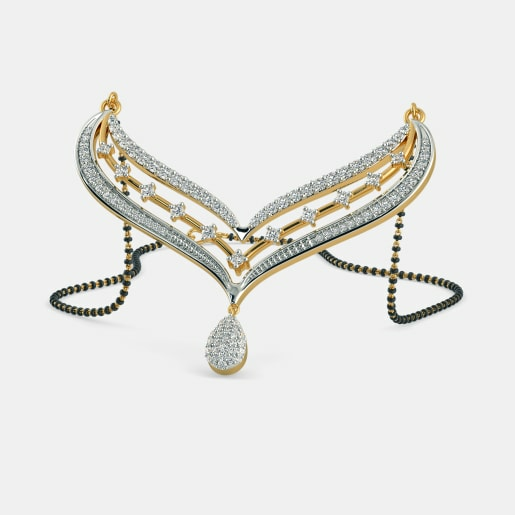 With the changing times, the design and style of this neckpiece have evolved to accommodate the taste of the modern woman. But what remains constant is the importance of the mangalsutra in a Hindu wedding. A few decades ago, the idea of wearing designer mangalsutras at one’s wedding wouldn’t have found many takers. But today, women no longer shy away from expressing their desires to wear exquisite mangalsutras for their wedding. Men too look for exotic mangalsutras to tie around their bride’s neck. 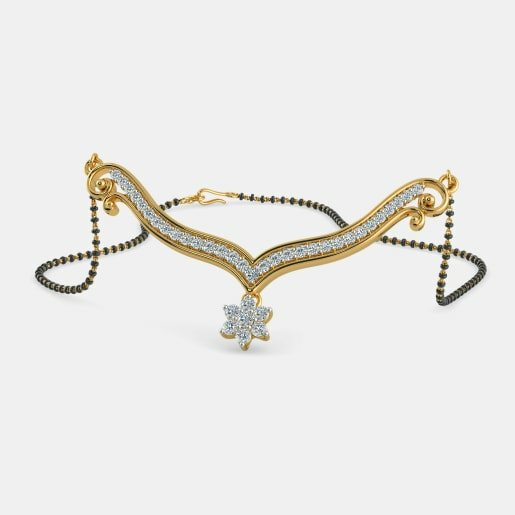 In keeping with such demands and tastes, BlueStone has launched a fascinating collection of wedding mangalsutra designs. 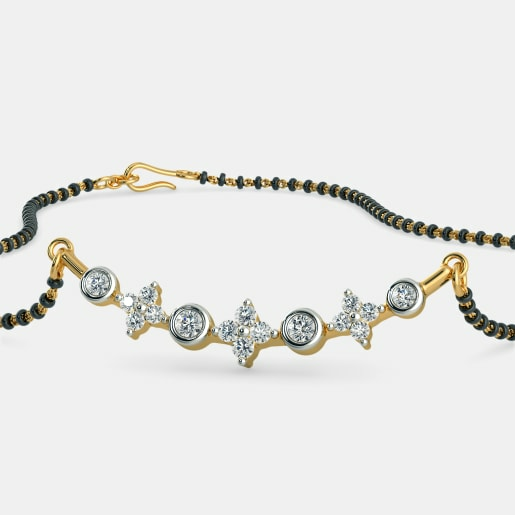 Whether you want a classic mangalsutra or a trendy piece, at BlueStone you are sure to come across the most incredible collection of artfully crafted wedding mangalsutras. 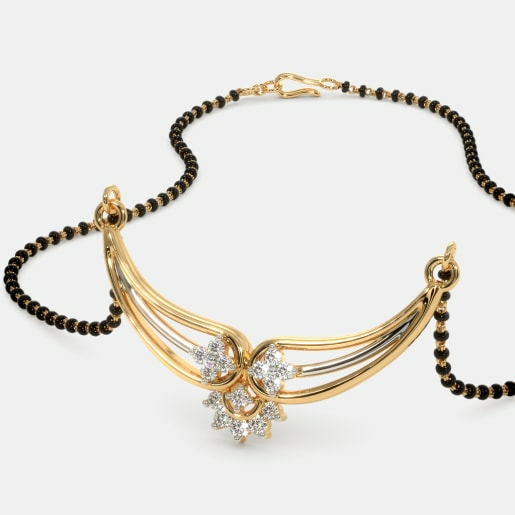 Take, for instance, our signature pieces like the Eshnika Mangalsutra and the Indrani Mangalsutra. While the former highlights elegance, the latter embodies a fancy design. Studded with multiple diamonds, both can make modern brides look resplendent. 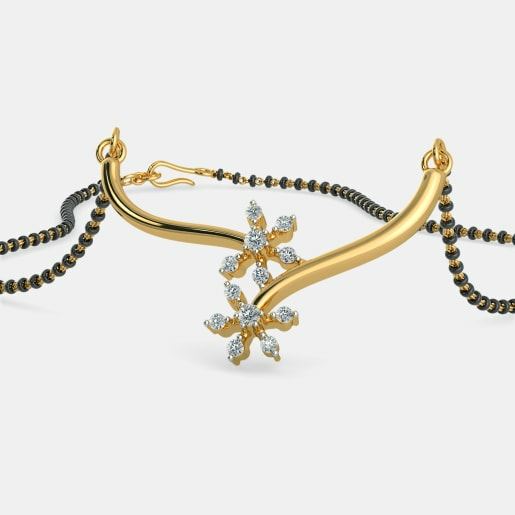 Then there is the Yashodhara Mangalsutra and the Varini Mangalsutra, both crafted in the fusion style. 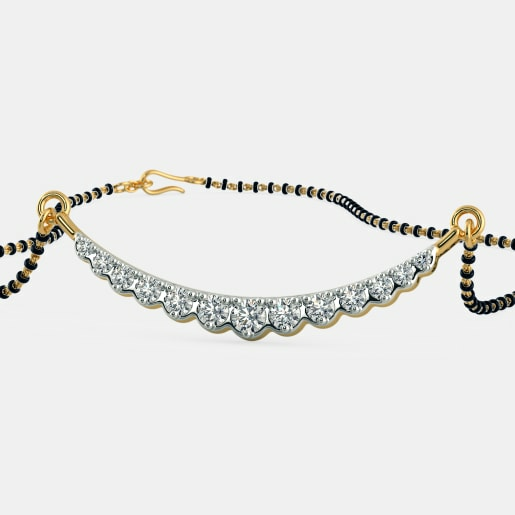 hese designer mangalsutras are trendsetters in their own right. 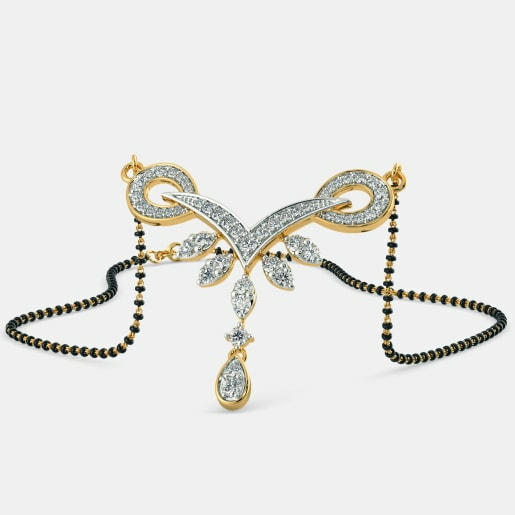 When you buy a wedding mangalsutra design for your bride, the ornament must not just reflect your taste in fine jewellery but it must echo your emotions as well. In such cases, exotic pieces from our collection, like the Rena Mangalsutra and the Madhurima Mangalsutra can be great choices. 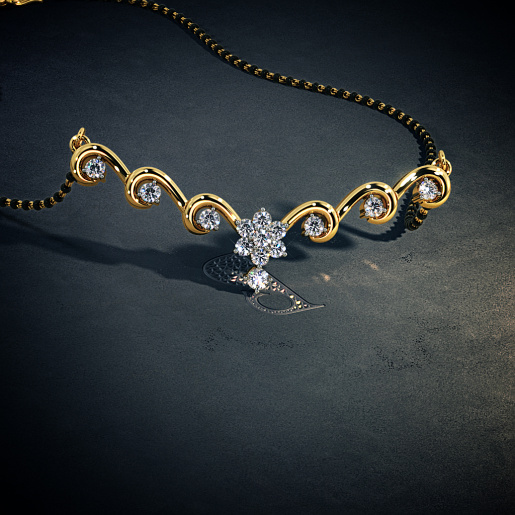 The Sifira Mangalsutra with its gorgeous look can spread a smile on the lips of any bride. With the convenience of online shopping thrown open, now you can buy wedding mangalsutra designs from BlueStone at any time. 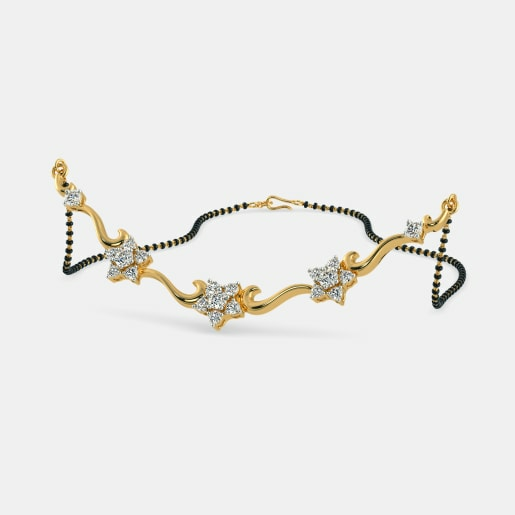 Just go through our designs, select the one that suits your taste and budget, and buy wedding mangalsutra online without any hassle. It’s said that diamonds are a woman’s best friend. Our wedding mangalsutra collection brings to you a plethora of mangalsutra designs crafted with glittering diamonds. 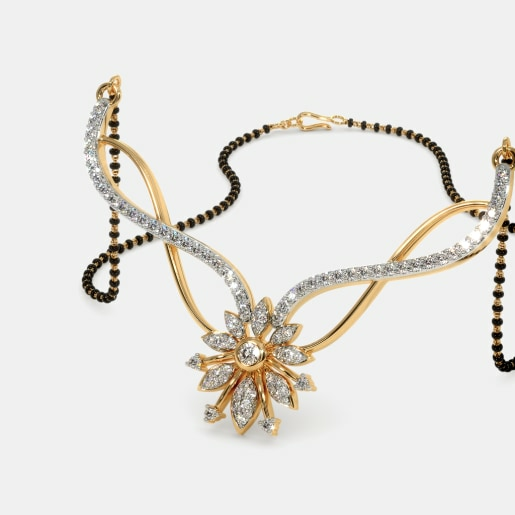 Take a look at our scintillating pieces like the Stuti Tanamaniya and the Upasana Mangalsutra. Encrusted with dazzling diamonds, these splendid pieces with their exceptional designs will make you shine and sparkle on your big day. 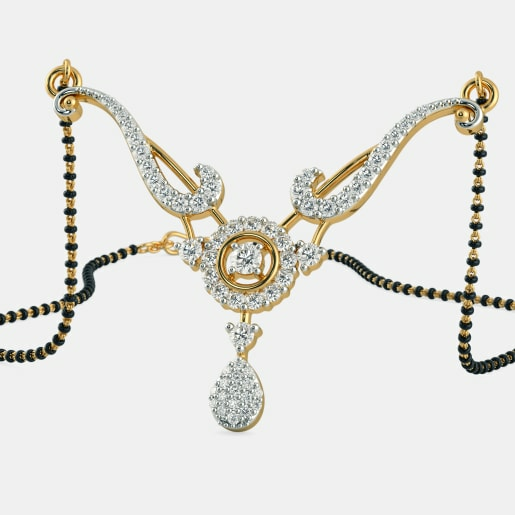 Among this category of diamond-studded mangalsutras are unconventional pieces like the Damayanti Mangalsutra, the Anokhi Mangalsutra, and the Ashmi Tanamaniya. What set them apart from the rest are their exquisite designs and the abundance of diamonds. 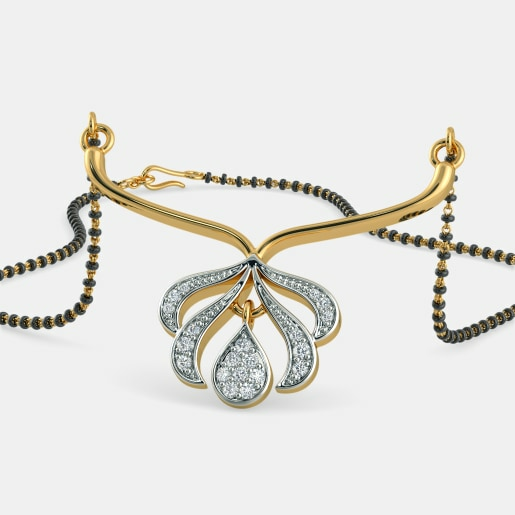 With over a hundred diamonds etched on a beautiful design, each of these pieces speaks of sheer luxury. 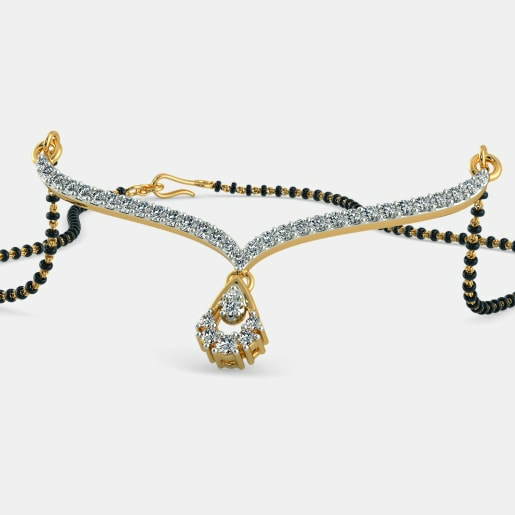 If you want a sleek diamond wedding mangalsutra design that you can continue to wear to your office after your marriage, then our Aditi Mangalsutra or Drahokam Mangalsutra fits the bill perfectly with their elegant styles. 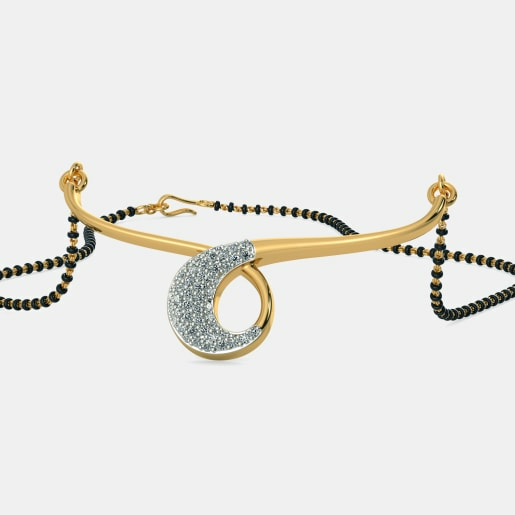 Even the Dhwani Mangalsutra with its classic style is a great choice for the same purpose. When you want the radiance of gemstones on your wedding mangalsutra designs, we suggest you go for our diamond and ruby mangalsutras. The vibrant mix of white and red stones will enhance your look by several notches. What’s more? They go well with your traditional and modern outfits. Take a glance at our Sanjeevani Mangalsutra and the Parineeta Mangalsutra, and you will realise what wonderful pieces of craftsmanship they are. 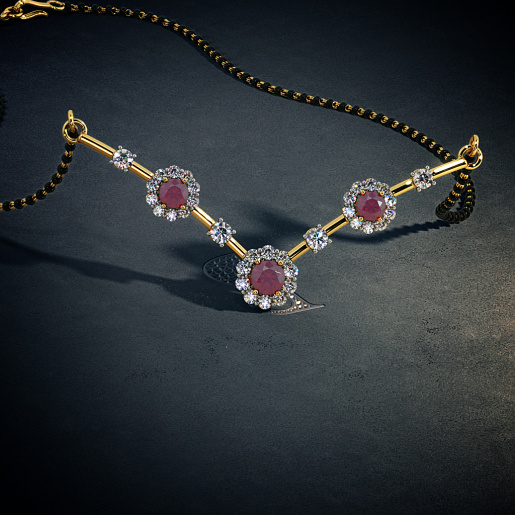 Other hot-selling items in our collection, like the Utpala Mangalsutra and the Geetanjali Mangalsutra, have multiple rubies glittering among white diamonds. 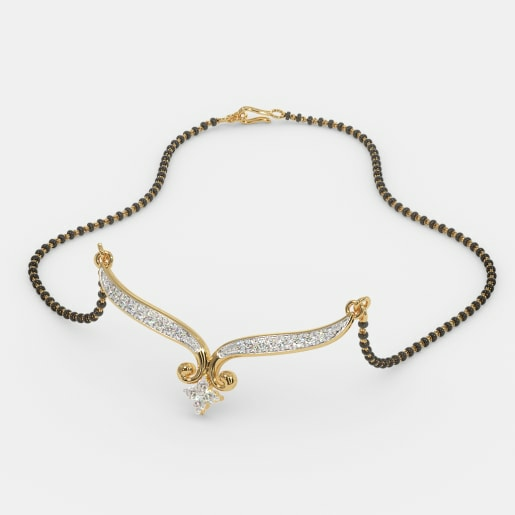 The Dhana Mangalsutra is quite a popular choice from this category. 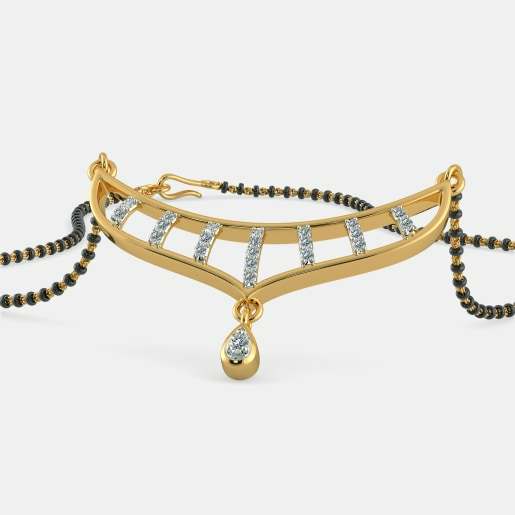 Blending traditional themes with modern trends, this collection offers you an incredible range of mangalsutras created in 18kt and 22kt gold. 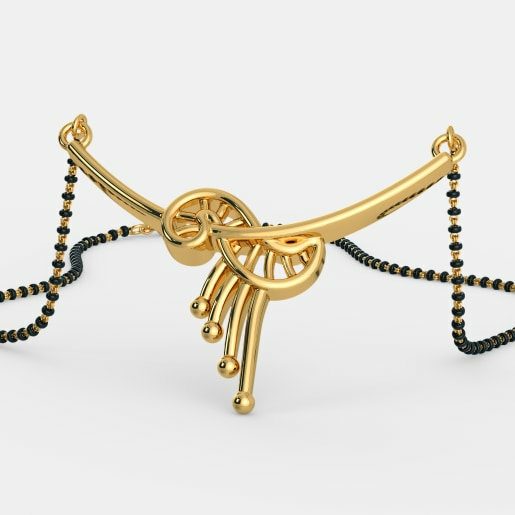 Our innovative mix of 18kt gold wedding mangalsutra designs includes stunning pieces such as the Alhaja Mangalsutra and the Padmaja Mangalsutra. If simplicity is your style, we have the Anamitra Mangalsutra and the Jayashri Mangalsutra designed in the fusion style. If the lustre of plain gold entices you, we are sure our charming designs from the 22k gold wedding mangalsutra category will captivate your senses. 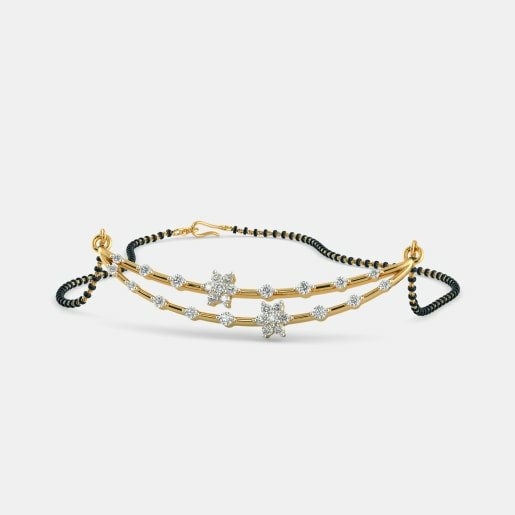 You will be spoilt for choice with pieces like the Dhanishta Mangalsutra with a necklace design, the trendy Rujula Mangalsutra, or the quirky Samali Mangalsutra. When you want to flaunt your wifedom in style, nothing should come between you and your favourite design. That’s why we have kept the range of our wedding mangalsutra prices wide and affordable. So, don’t wait further. Make your pick today.